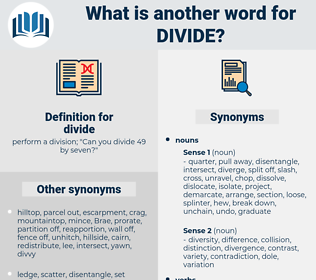 What is another word for divide? perform a division; " Can you divide 49 by seven?" disparity, chasm, separation, distinction, partitioning, disagreement, gulf, compartmentalization, distribution, Separating, differentiation, dissension, disproportion, abyss, fragmentation, Fracturing, disintegration, sharing, mismatch, watershed, unbundling, dispense, dismemberment, ditch, segregation, inequality, discord, share, barrier, carve-up, distribute, precipice, disunity, fracture. separated, segmented, partitioned, fragmented, structured. allocate, dispense, share, distribute, fracture, disperse. partitions, breaks, separates, comprises, consists. differentiate, hyphenate, allocate, segregate, distinguish, fragment, Disaggregate, sharing, dissociate, prorate, dispense, share, redistribute, distribute, disrupt, fracture, disperse. convince, fix, collect, append, stay, fasten, persuade, hold, gather, keep, wait, unite, marry, connect, agree, maintain, disorganize, disarrange, mend, attach. couple, blend, join, refuse, close, converge, knit, associate, retain, combine, meet, agglutinate, appropriate, confiscate, stick, weld, bind, cement, mix, resume, seize, link, deny. You came in from the Dayspring - over the divide? He thinks you got over the divide. devoid, defeated, dipped, debt, debit, diabeta, david, depth, devout, depute, deviate, deputy, deadbeat, doped, depot, day bed, divot, dead body, devoted, doubt, DVD, deathbed, davit, dipodidae, deaf-aid, devotee, day by day, deep-eyed, daybed, duvet, deadbeat dad, deft, devote, deep-dye, defeat, daft, debate, debut, defat, dubiety, divided. reduce, subdivide, break away, disjoin, disjoint, detach, dismember, chip off, partition off, break off, polarise, calve, section, gerrymander, chip, polarize, take apart, come away, come off, segregate, segment, break up, Discerp, partition. break up, dispel, break, partition, detach, scatter, close off, shut off, disperse, rail, zone, dissipate, rail off.